Ri-Man is a sensitive felllow with a role to play in future healthcare. There are already plenty of tough-looking robots designed to go places humans daren't venture, so it makes a pleasant change to come across a metal man purpose built to be nice to people and to make life a little more pleasant. 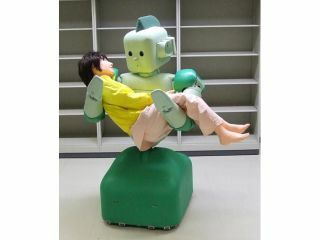 Ri-Man is a 158cm caregiving robot developed in Japan by the Bio-Mimetic Control Research Center at government agency RIKEN. The 100kg machine is unique in that it is covered with soft, green silicone to make it both warm to the touch and soft. The reason for the user-friendly exterior lies in the fact the Ri-Man's future role will see it lifting bed-ridden or otherwise-disabled patients to carry them around their homes, hospitals or rehabilitation centres. Underneath that silicone skin are over 300 sensors and tiny motors that monitor how hard the human payload is pressing down and adjust the skin tension accordingly to make the ride more comfortable. Naturally, Ri-Man also has all the abilities we expect of normal robots, including video-camera eyes, face recognition and microphones for ears, although we hadn't expected it to have been blessed with a sense of smell as well. The machine's creators added an odour-detecting nose to enable it to detect scents such as gas and human urine, which is definitely a first for any robot we know.